Daring Date Nights | Breezy Mama Breezy Mama - Expert parenting advice, celebrity interviews, product reviews for kids, moms and babies and more! Last chance! Join Positive Parenting Solutions and use code breezy15 to save 15%! Plus, join by midnight tonight and get a FREE upgrade to lifetime access! Click here! Win It! Wal-Mart and P&G are offering Breezy Mama readers a chance to win their latest family movie, The Jensen Project–see below for details! When the waitress at your go-to restaurant knows your order and you’ve seen every movie that’s out in the theater, it’s time to take date night up a notch. Breezy Mama turned to two different adventure experts –Jane Reifert of Incredible Adventures and Camille Leon, Co-author of The Exhilaration Effect — to get ideas on places to boldly go outside of your comfort zone and rev up the adrenaline with the man you love. Forget Edward and Jacob — check out some real life blood suckers! 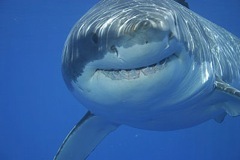 Shark diving, or cage diving, allows divers to view the extraordinary world of Great White Sharks in comfort and safety. Specially designed shark viewing cages provide adequate protection for the sharks from sport divers, while allowing divers total freedom of movement and panoramic views. Available in San Francisco from Incredible Adventures. Not in Cali? Check with the nearest public aquarium. Many public aquariums have programs where people can get into a tank with sharks and/or other wildlife encounters. Or maybe a nice enclosed boat is more your speed. A new generation of sub, the Aviator is a multi-purpose machine built to explore the underwater world. She’s nothing like traditional subs that maneuver like bulky balloons. In the Aviator you strap into the same 5-point harness restraint used by Indy racecar drivers and fly underwater. Prepare yourself to discover hydrobatics (think underwater aerobatics) during your three day multi-flight training adventure or do a one day, single flight program for a quick intro to the Aviator. TO BOOK: Contact Incredible Adventures. Get your zoom on! Climb inside an authentic NASCAR Winson Competition car for an incredible driving adventure. You’ll be learning from the instructors that prepare drivers for professional racing careers. One, two and three day short track racing classes available. Firesuits, helmets and gloves are supplied. It’s mandatory to be able to drive a 4 speed transmission. Available from Incredible Adventures in several cities or check with the race track nearest you to see what driving adventures are available. pistol shooting, unarmed self-defense, contact driving, evasive driving and more from battle-tested experts. Two day and three day training programs are available at a former military training base near Tucson. The highlight of the weekend is a hostage rescue operation. Available in Tucson Arizona from Incredible Adventures or google “secret agent fantasy camp” in your area. Take your breath away. Fly the legendary Zeppelin Airship. Soar 1,300 feet above the land enjoying stunning views of the Golden Gate Bridge, the Hollywood Sign, the Queen Mary and more. The Zeppelin NT Eureka is based at historic Moffett Field, near San Francisco, California. The Zeppelin NT is bigger than a Boeing 747 and cruises at a leisurely 35 mph. The gentle pace makes is easy to capture great photos of the sights below. Individual flights, group charters or pilot for a day available (must be a pilot for this option). exploding volcanoes and pristine beaches. Activities can include bungee jumping, whitewater rafting, kayaking, zip line canopy tour, waterfall rappelling, horseback riding, mountain biking, hiking, surf lessons and soaks in natural hot springs. Incredible Adventures will customize the adventure for you or your group. Not headed to Costa Rica any time soon? Google any one of the adventures to see where they are offered in your area. Are you stuck in a rut? Is your relationship stuck in a rut? Is it time to shake things up? Do something different, really different, and enjoy the Exhilaration Effect~ (You just might remember the ‘rush’ of young love)! When is the last time you went ice skating or roller skating? If it’s been years (or decades), go rent some skates at your local rink! Google is my favorite search engine for finding skating rinks of any sort. ‘Breathing underwater’ is unlike anything you’ve ever done before! It takes more than one night to become a SCUBA diver. Still, it’s a great couple (and family) activity and lots of fun. Search online and ask for references. Equipment and safety are important! So many big events in life are ‘like jumping out of an airplane”! For couples, this is an amazing shared experience which can be very bonding. I recommend a tandem jump so that you’re paired with a professional instructor for safety purposes. Surprisingly, skydiving is fairly affordable and is a great one-day adventure. Go ahead and get the video ~ it’s worth it! Again, search online and get references. Equipment and safety are important! Rather than going to the same spot as everyone else, go to a Third World country and volunteer on a community development project. You will gain new perspectives to enhance your life back home and share memories that will last a lifetime! Check with any charities/organizations that you are already involved with, or with your church. I recommend choosing an adventure that neither person has tried before. Win it! Wal-Mart and P&G have teamed up to bring family movie night back into the house. As a follow-up to the Secrets of the Mountain, they’re releasing The Jensen Project, a thrilling, action-packed adventure on NBC tomorrow night, 8/7c. They’re also giving away the video, as well as the soundtrack (produced by Randy Jackson) to one lucky Breezy Mama reader! To enter, tell us what was the last movie you watched together as a family in the comments section below. 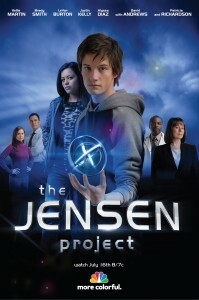 To learn more about The Jensen Project, click here! Camille Leon, Co-author of THE EXHILARATION EFFECT: Building the Courage to take Your Leap of Faith and Executive Director of The Holistic Chamber of Commerce, believes in a healthier and happier world through our choices. Adventures enhance our lives and our relationships in many ways. She can be reached at ExhilarationEffect@live.com or through her websites. Originally from Iowa, Jane joined Incredible Adventures in 1993 as a marketing assistant. In addition to overseeing worldwide adventure operations, Jane handles the company’s marketing and media relations. She’s the author of Executive Adventures, a guide for excitement-deprived individuals, and offers advice to prestigious aerospace companies about space tourism stuff. 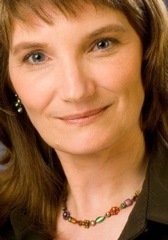 In 2005 Jane became Chair of the Space Tourism Subcommittee of the Space Colonization Technical Committee of the American Institute of Aeronautics and Astronautics. Pre-IA, she spent nine seasons working in minor league baseball with the White Sox, Cardinals and Cubs organizations. Although a self-described adventure wimp, she’s flown a jet in Moscow, raced a truck, jumped out of an airplane, been a Covert Ops hostage, seen great white sharks in Cape Town and ballooned over the Sahara. When not in the office, you’ll likely find her on a tennis court or on Sarasota’s Siesta Key beach playing volleyball. I have to suggest one more daring one for those of us Southern Californians: Trapeze Lessons! We discovered that on the Santa Monica Pier you can take a Trapeze lesson by the New York School of Trapeze. Then afterwards stroll the beach of Santa Monica or enjoy a fabulous dinner in the city! the last movie we saw as a family was gran torino with clint eastwood. fab movie many lessons, and tears for everyone!